How to set expression to return MatID for both Corners (Before and After segment)? There are a lot of going on in Your scene. I am a bit lost in it. Maybe there is a matter not only of expression but style/geometry itself. Could You create a simpler scene with clearer expected final result. from Your situation it seems like it has to be just number "3". and something else has to be done to prevent it's effect in other places. 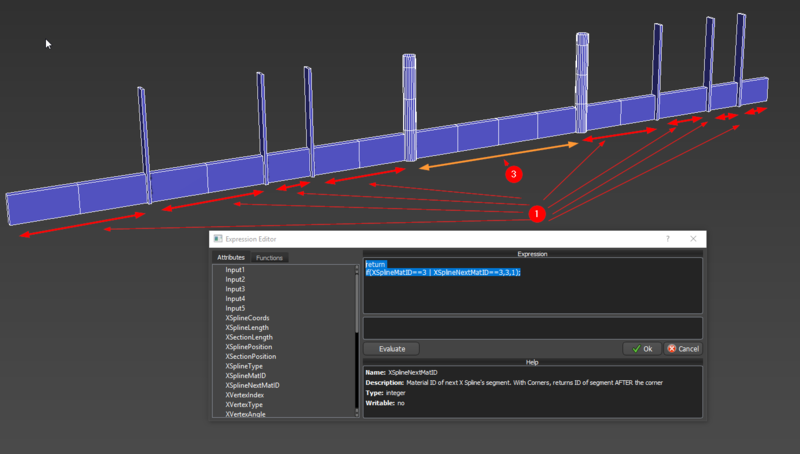 Since this is just a part of more complex generator it will be great to have expression Attribute that combine XSplineMatID and XSplineNextMadID so both corner vertex can be included/excluded. Yes Rokas, thank you, but that solution force me to track all potential ID separation. Imagine complex Spline with 35+ spline IDs. If I go with logic that certain spline ID will carry some Geometry that includes/excludes both border corners, expression Attribute that include/exclude those corners will be very helpful (no need for If expression...). Hope you understand and it make any sense. Isn't that what You have asked in the first post? Solution is great, I`m talking about adding a new Expression Attribute as ER.